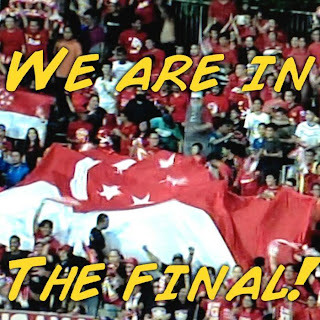 BoLASEPaKO.com - a simple view on Singapore Soccer: [Instant Reaction] Singapore 1-0 Philippines - WE ARE BACK TO THE FINAL!! [Instant Reaction] Singapore 1-0 Philippines - WE ARE BACK TO THE FINAL!! What I really hope the outcome of us heading to the AFF Suzuki Cup Final for the first time five years is not being overshadowed by the "PalmerGate" that took place so suddenly this afternoon. The Lions kept their composure throughout the game and was unfortunately not able to add more to the tally after Khairul Amri's 25-yard shot from outside sent the mostly red-shirted supporters into a state of euphoria in the 19th minute. With midfield anchor Fahrudin Mustafic being replaced at half time due to some knocks (apparently), it was thought that the Azkals could finally seize the opportunity and capitalize the Tampines Rovers' stalwart's absence to make inroads to the Singapore's frail defence. Yet, unlike the vigour they shown in Manila, the Filipinos found themselves banging onto the stout midfield that was well coordinated by Isa Halim with Aleksandar Duric, dropping deep behind to disrupt the flow of play of the visitors. With minutes ticking away, we saw the Lions doing the sensible thing to hold back in numbers at the back till the end that saw us in the final to regain that regional supremacy.